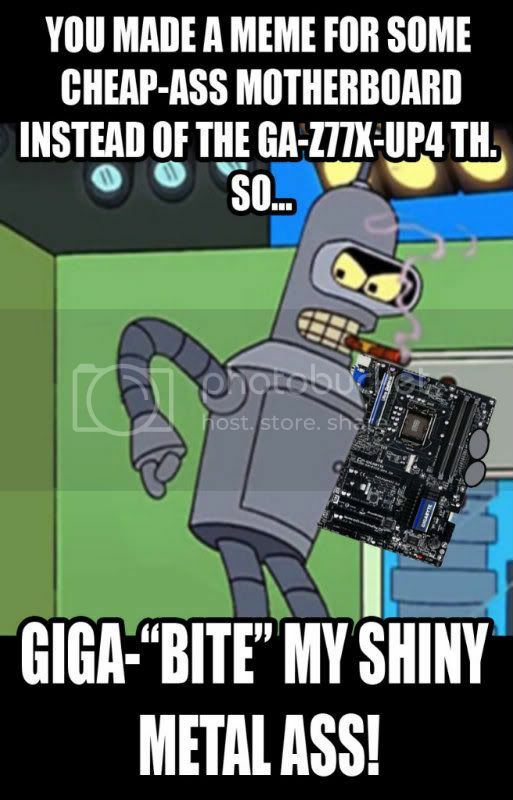 A Meme For A Mean Motherboard - Join and Get a Chance to Win a Gigabyte GA-Z77X-UP4 TH! Do you love memes? Or do you like creating memes? 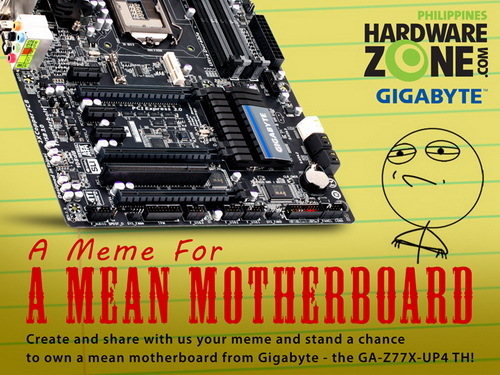 Finally, here is a chance for you to show us your talent and win a mean motherboard from Gigabyte – the GA-Z77X-UP4 TH! What makes the GA-Z77X-UP4 TH mean? A motherboard based on the latest Z77 chipset, the GA-Z77X-UP4 TH is designed to support third generation Core CPUs, the latest, powerful, intelligent, and energy-efficient processors from Intel. Delivering fast computing performance, the GA-Z77X-UP4 TH is equipped with current technologies, taking onboard USB 3.0, SATA 6Gbps, mSATA, and most importantly, two Thunderbolt ports that can accommodate up to twelve compatible devices. With Intel’s Z77 chipset and latest processors, the GA-Z77X-UP4 TH delivers good visual performance with Intel HD Graphics. But if it isn’t enough, this new Gigabyte motherboard has PCI-Express 3.0 slots that can handle the fastest graphics cards in the market today. Multi-GPU technologies such as NVIDIA’s SLI and AMD’s CrossFireX are supported as well. Power users will enjoy pushing the GA-Z77X-UP4 TH beyond its limits. Assimilating Gigabyte’s Ultra Durable 5 motherboard design philosophy, the GA-Z77X-UP4 TH can handle harsh conditions brought about by overclocking. 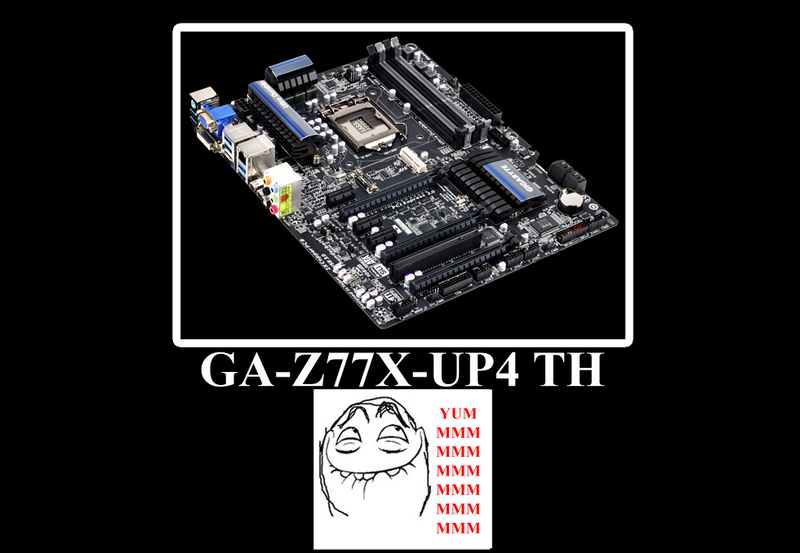 Are you excited and ready to grab the opportunity to own a Gigabyte GA-Z77X-UP4 TH motherboard? All you have to do is to join our growing community, take part in the contest, and share with us your meme about Gigabyte and Gigabyte products. 1. A Meme For A Mean Motherboard is open to Filipino citizens who are currently residing in the Philippines and are of legal age. 3. The participant must also like HardwareZone Philippines (www.facebook.com/HardwareZonePH) and Gigabyte Philippines (https://www.facebook.com/pages/GIGAB...19382288144521) fan page on Facebook. 4. To submit an entry, the participant must post his/her meme on the contest’s official thread. 5. The meme should be intended to promote Gigabyte and Gigabyte products. 9. The winner must not be related to HardwareZone Philippines or Gigabyte in any way. 11. The contest will run from September 11 to October 11, 2012.
we can use any GA-Z77X-UP4 TH right? Are you asking about the image for your meme? Nice contest. Would love to join this one. Thanks! time to put my thinking cap on..
Rodney Reynolds of 3dgameman.com Gigabyte GA-Z77x-UP4 TH Review! Last edited by ronjames; 12-09-2012 at 09:20 AM..
Nice giveaway HardwareZonePH! Can't wait to see creative and witty meme from you guys who will squeeze their brain to the extent of brain lag just to get this monster board. Last edited by bloodmood; 11-09-2012 at 10:34 PM..